Operation HOPE the leading global financial dignity nonprofit, today announced the Co-founder and CEO of Pantheon Enterprises Laura Roberts for the Main Stage in Atlanta, GA January 15-17th. The annual forum, hosted by HOPE at the Omni Hotel in downtown Atlanta, Georgia, will bring together heads of state, C-suite executives, civic and financial leaders to outline a vision for the future of the modern global economy. This vision that includes all people as HOPE sees the poor, underserved and teetering middle class as untapped assets for economic growth, entrepreneurship and job creation. Co-founder and CEO of Pantheon Enterprises, Ms. Roberts is a leading force behind the company’s business development and expansion plan. Since 1999 Ms. Roberts directed an extensive reorganization of the company to include: development of its executive management team; protection of its IP; automation of its manufacturing operations; and a clear definition of its marketing and distribution strategy. Additionally she secured the necessary financing to commercialize the chemical technologies throughout multiple worldwide distribution channels. (Complete bio) Since 1992, Operation HOPE has been providing financial dignity and economic empowerment to more than 2 million individuals worldwide. It is America’s only nonprofit software company specializing in the software of human development — reverse engineering poverty. HOPE’s goal is to turn check cashing customers into banking customers, renters into homeowners, small business dreamers into small business owners and minimum wage workers into living wage consumers. For additional information about Operation HOPE, go to www.operationhope.org. To learn more about the 2015 HOPE Forum, please visit HopeGlobalForum.org. 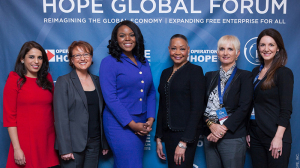 Follow the conversation about the latest news on the 2015 HOPE Global Forum on Twitter, @operationhope, #2015HGF and like us on Facebook.